Welcome fall!! Even in our warm Southern California climate most of us can feel the early signs of fall in the air, nights and mornings are starting to have that crisp, cool flavor to them and an all around energy of fall is starting to slowly pervade the ethers. I for one am definitely looking forward to some cooler nights, cozy sweaters and hot chai tea! Summer was an exciting adventure for me as I traveled to Nevada City to complete my training in Ayurvedic Bliss Therapy at the California College of Ayurveda. Here I learned and experienced abyhanga (warm oil massage), shirodhara (warm oil head treatment) and svedana (steam therapy). 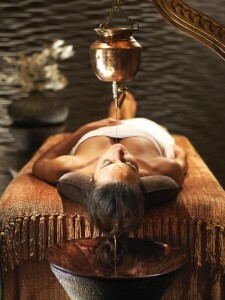 Bliss Therapy it is indeed and some lucky clients have already experienced it! I then traveled to Sedona where I participated in a Native American medicine wheel ceremony, had a wonderful psychic and aura reading with a Native American psychic, and experienced the healing power of the Sedona vortexes. A spiritual place most definitely that intrigued my curiosity to investigate some shamanic healing rituals (there might be a shamanic surprise in your next healing session!) and I can’t wait to go back for another visit. 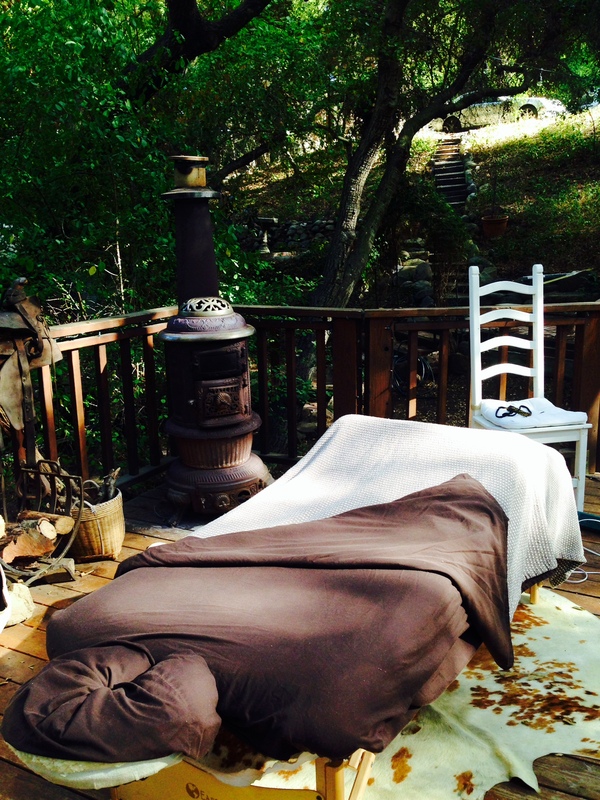 I am also now on call at an amazing, quiet retreat in Topanga called The Chianti Life Retreat. So if you need a short get away in nature with yoga, healing sessions and gourmet meals prepared for an alfresco dining experience under the trees, let me know! Short day retreats are also available. I officially started studying with the renowned Ayurvedic doctor Vaidya RK Mishra in July, and am excited to share this information with you. By May, I will have completed my first training with him and will be able to read imbalances in your pulse, and provide some Ayurvedic solutions. What is Ayurveda exactly? Ayurveda is a 5,000 year old holistic system for health and wellness from the spiritually rich land of India and is the sister science to the practice of Yoga. This system heals by offering complete lifestyle recommendations that are specific to each individual. All aspects of life are considered – sleep, diet, herbs, spices, spiritual practice, exercise, etc. to create a balanced way of living. I am in love with this all encompassing system. I am also continuing my massage therapy education at the Hands on Healing institute. I feel that this is a period of great expansion and growing of my healing art to be able to help you with all the tools I have sharpened in my healer’s tool box. So here we are finally wrapping up summer and getting into the fall season. With the ushering in of fall, our environment, as well as our physiology may start to become dry, our joints a little achy, our thoughts and energy may feel a bit more scattered and erratic, and our sleep may become restless or interrupted. According to Ayurveda, these are all signs that the element of vata (space + air) is increasing within us just as it is outside. We also may get sick at this time due to the drop in temperature causing our channels that help us eliminate toxins to shrink down, causing a toxic overload, lowering our immune system, also trapping heat inside our body still left over from summer and potentially resulting in “the flu”. Click on the article link in the next paragraph written by Vaidya Mishra to read a more detailed explanation of what is happening during this seasonal shift and what to do about it. 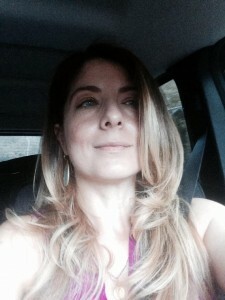 What are some of the ways to tame that vata from getting too out of balance? Massage is one of the most effective ways to soothe vata. Daily self oil massage, as well as getting professional massages is highly beneficial in keeping the skin lubricated, helping to detoxify the body and soothe aching joints and is also good for all doshas. If you would like to incorporate daily massage into your routine, please ask me so I can suggest appropriate oil for you. 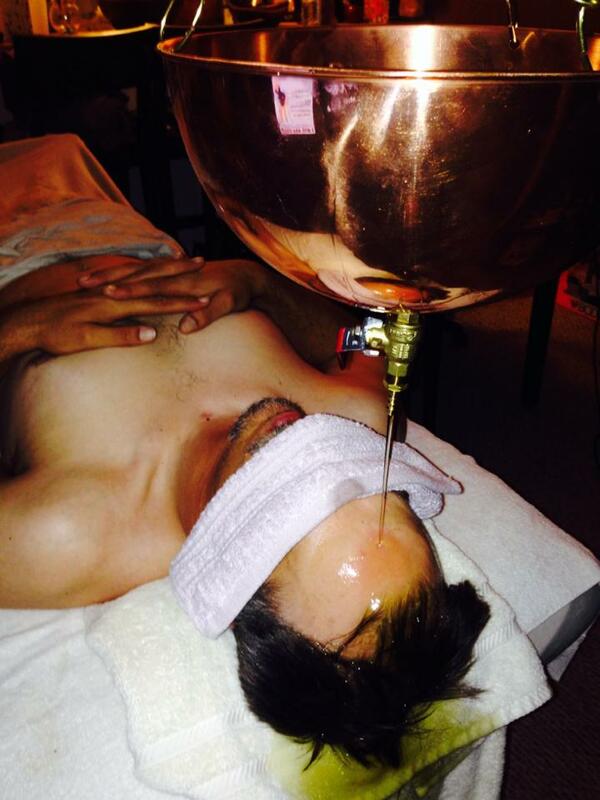 Shirodhara (aka “natural xanax”, warm oil streamed from a copper pot over the third eye continuously for up to 40 mins) also is very effective in helping balance vata as it helps calm the mind and put you into a deep meditative state. It also helps heal sleep issues and has numerous other benefits. Eating a diet appropriate for your dosha is also essential right now. Find a complete article on this seasonal change written by Vaidya Mishra here: Ritu Sandhi Season Shifts. See my flyer below for some exciting things I am offering for the fall season to keep vata and all doshas in check! 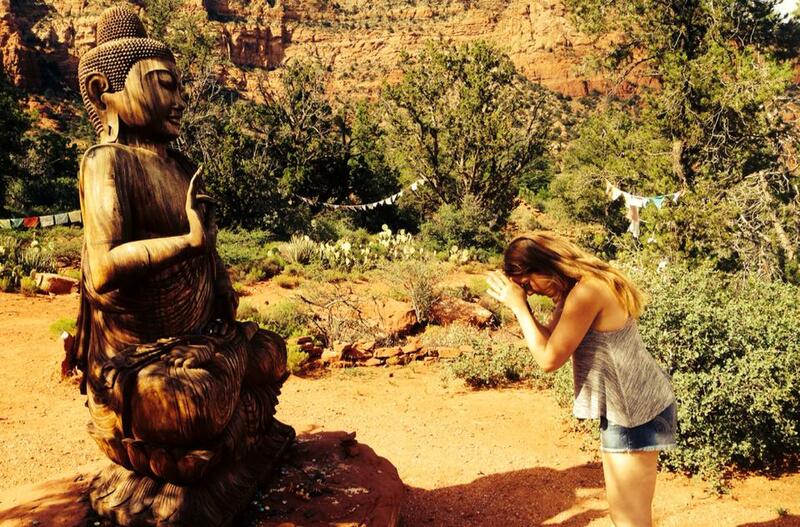 Attention all those wishing to learn Reiki – Reiki Level I attunement workshop is now forming. If you would like to join, please email me. Reiki Level 1 teaches you the first level of energy healing so that you can work on yourself, plants and animals. All level attunements available by private appointment. Please see my website for more info. Thanks for reading my newsletter all! Wishing you a wonderful autumnal season! P.S. Please visit me at Whole Foods Market Tarzana on Mondays from 12pm-4pm doing mini sessions. Stop by, say hi and get a quick rub! 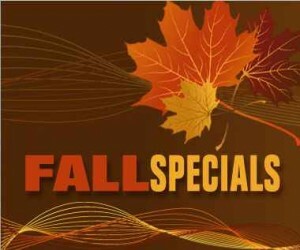 Fall Healing Special! I invite you to take part in my fall special, what I call the “Healing Junkie’s Grab Bag.” Because I really want you to try all of this stuff and if you’re not a junkie already, you will be! No better addiction than good self care! What do you get? For one flat discounted price, you get to pick up to 4 different therapy sessions to have at your home and have a different session every two weeks!! FUN! That should pretty much get you through the rest of fall. You must pick at least 2 different things so you can have a taste of the different healing modalities and we can combine them for a deluxe session. These special packages are on sale now through November 30th. You may also make this a gift. (4) 90-Minute Sessions – $580 a $60+ Savings!! Extra for outside of West SFV. (4) 120-Minute Sessions – $740 a $50+ Savings!! Extra for outside of West SFV. FIRST TIME CLIENTS mention this ad and Get a 1.5 hour session for the price of 1 hour – $120 a $40 Savings! Extra for outside of West SFV. Fall Bonus! Buy at least 2 hours of chair massage for your company and get half hour free, must be used in the same day. To read a description of these therapies, please visit the services page on my website www.theartofevolution.net/services – credit cards, checks and cash all accepted. *Most sessions are done as outcall. Please note that not all therapies can be provided as outcall – if you have stairs or anything that makes transportation of my equipment difficult, I will not be able to bring my equipment in unless you can provide me with an assistant to transport it for me. For ayurvedic therapies, you must have sufficient space with a non carpeted floor. I take the utmost care in my set-up, however I will not be responsible for any oil stains to your floor. You may have your appointment at a private location in Encino or at The Chianti Life Retreat in Topanga where the session will be held outdoors if your home is not suitable for a healing session or you prefer to do it elsewhere. Please inquire when purchasing your package. This offer can be shared with family member living in same household only. Sessions must be used within 90 days of purchase or the special price will no longer be extended. Don’t miss out on your chance to get in on my fall specials, the deadline is NOVEMBER 30th!